Liri Tent Technology is the biggest and most experienced tents manufacturer in China with 18 years history. 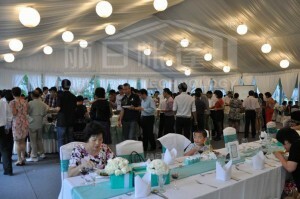 We have many sizes of marquee for banquet for you or customized according to your guest quantity. A 20′ x 40′ marquee for banquet could accommodate 100 seated theater style (rows of chairs with an aisle up the middle) or 64 seated at round tables of 8. A 30′ x 60′ could accommodate 225 seated theater style, 144 seated at round tables of 8, or 180 seated cafeteria style (rows of 8′ banquet tables). A 40′ x 60′ could accommodate 120 seated at round tables of 8 with a buffet, bar, cake table and dance floor. All of the equipment and accessories of marquee for banquet you need to create a distinct and individual mood are available right here. You can count on us to provide personalized service from consultations and site surveys to professional and friendly installation and removal. Please call for your free personal consultation.